When it comes to navigation apps, Waze reigns as the best available. Waze was purchased by Google a few years ago and has developed into what’s likely the most widely used navigation app available. I personally use it a lot in a car but what about a motorcycle? Is a standalone GPS better? Let’s compare a Garmin Zumo versus Waze on a smartphone. If you aren’t familiar with Waze, a screenshot accompanies this article. Waze is a smartphone app available free of charge. It’s not a typical GPS app. Real time traffic flows and user generated alerts are embedded in the maps and the suggested navigation route takes that information into account. If you haven’t tried it, download it now and check it out then come back to read the rest of this article. So the question is if Waze is the best out there. For that we do a head to head analysis with the leading motorcycle GPS. It’s a Garmin Zumo versus Waze on a smartphone. The smartphone app is the same on iOS or Android so you can apply our Garmin Zumo versus Waze analysis to either platform. Most Garmin Zumo models sold over the past few years have the letters “LM” after the model number. That is an acronym for Lifetime Maps. Garmin updates their maps a few times annually and if you have a Zumo with a lifetime map subscription the updates are free but must be manually applied. Waze updates their maps regularly and solicits corrections from the user base. The update happens on the fly and since the maps are loaded through the internet, there’s nothing the user must do to upgrade the maps. On map accuracy, both are accurate. Comparing a Garmin Zumo to Waze, there doesn’t seem to be a difference in map accuracy. A Garmin Zumo is weatherproof. As an example, the Garmin Zumo 395LM is rated as IPX7 which means it withstands incidental exposure to water of up to 1 meter for up to 30 minutes. Good for light to moderate rain. While we don’t advise riding in the rain, this means that you don’t need to worry about your Garmin Zumo getting wet. Compared to a smartphone, there are some advantages to a dedicated GPS. The display is typically anti-glare and glove friendly. Glare on a device mounted on a motorcycle’s handlebars can be brutal. Older Garmin Zumo models were susceptible to road glare. Not so much on the models sold over the past few years. Waze isn’t a hardware company. It’s runs on a smartphone. A Samsung Galaxy S7 Edge and Apple iPhone 7 are waterproof but most aren’t. Additionally, there aren’t any that we know of that are glove friendly and most aren’t anti-glare. Of course, a smartphone has overall greater ability versus a Garmin Zumo but we’re simply comparing these two devices in their motorcycle GPS abilities which is why the Garmin Zumo comes out ahead in the hardware category. Both solutions benefit from a variety of mounts. You get what you pay for here. We like to steer people towards metal mounts that are well made. A Garmin Zumo comes with a metal mount made for motorcycle use. It’s a well made holder that bolts onto a handlebar or clutch assembly. You can adjust the Garmin Zumo into a variety of positions to accommodate the rider. For Waze on a smartphone, you will need to buy a good holder. Avoid cheap plastic holders. Go with a reputable maker and purchase a mount that’s made for a motorcycle. The Garmin Zumo is ready to install on a motorcycle right out of the box. Not so with a smartphone. You have to buy an additional accessory. Some Garmin Zumo models come bundled with live traffic. The Garmin Zumo 595LM includes live weather radar and traffic information from the Smartphone Link app. However its sibling, the Garmin Zumo 395LM doesn’t have any of that. I find this traffic feature works well in larger metropolitan areas. Not so much in rural areas. Waze has full-time live traffic reports which are supported by traffic networks, real-time measurements and social interactions from the user base. It’s reliable from practically anywhere. I remember getting accurate traffic alerts in a rural section of Pennsylvania recently. 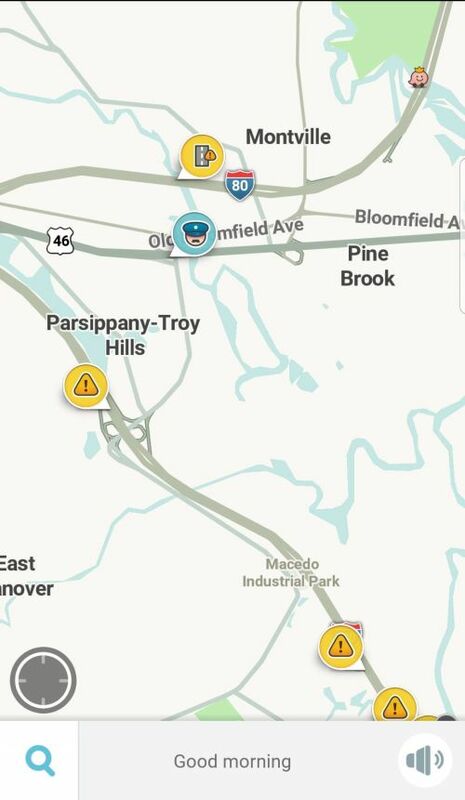 Believe it or not, Waze also provides alerts for things that you would not expect. This is all thanks to the user base. Examples include police action, a car in the shoulder and even roadkill. Waze traffic and alerts are simply more complete. Waze runs on your phone, so Bluetooth is already present. You might think that Waze would win this hands down but it doesn’t. When navigating with Waze and a call comes in, the app disappears to the background and the telephone application takes over. Your map is off the screen. You can get the map back by closing the phone app and opening Waze again but that’s not safe while driving. Additionally, while speaking to your party that just called, Waze will interrupt and override the speaking party. A Garmin Zumo has Bluetooth integrated with the device but you need to ensure you get a Bluetooth headset that works well with a Garmin Zumo. Additionally, not all Garmin Zumo models work the same when it comes to Bluetooth. We wrote an article on Bluetooth which outlines the capabilities and it’s worth reading if this is important to you. Bottom line is neither are perfect. Waze doesn’t have any motorcycle specific features. What are motorcycle specific features? Think about features such as the ability to select the type of route you want like more turns or hills or the ability to bypass highways. Think about things like alerts for sharp curves and information about state helmet laws. Also hardware features such as an integrated tire pressure monitor or glove sensitivity. You had to bring up cost? Waze is free. It’s supported by in-app ads. Can’t tell you if it’s profitable or not but it’s backed by Google. They aren’t going out of business. A Garmin Zumo isn’t free. Your cost depends upon the model chosen and no matter which model chosen, it’s going to cost more than free. This one isn’t even close. How do you compete with free? So there you have it. A Garmin Zumo and Waze have advantages and disadvantages. The above reflects the opinions of the author, you might have different opinions. Counting up the category winners, it’s a tie. Your decision should be based upon your personal criteria. If hardware durability is the most important thing, the Garmin Zumo is clearly the right choice. If cost is the number one priority, well you can’t beat free and Waze is the answer. There is still a need for dedicated GPS devices like a Garmin Zumo but there’s a huge market for anything free, especially a great application like Waze.